Thanks for stopping by - hope you have a creative day! It's your favorite time of the month: Anything Goes! this week! The Design Team are using Lawn Fawn products. You can use anything you want, but if you have any Lawn Fawn products, we'd love to see what you make with them, too! Hello! I'm thrilled to be participating in this blog hop to honor Kelly Latevola! Just about every Monday, in her CASEing Genius posts, Kelly chooses a fellow blogger, introduces her and her work to us, and then CASEs her guest's cards. 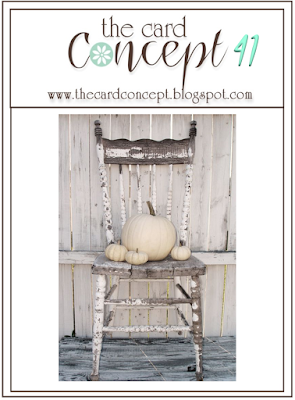 We decided to turn the tables on Kelly today and honor her with a blog hop. We have all been former guests on her blog, (HERE was my spot) and we'll all be choosing 3 of her cards, and making a card CASEing ideas from them! Fun, huh? When I think of Kelly's art, I think of bright colors and expert masking, and these cards illustrate that beautifully. Since Fall is my favorite season, I decided to go with a variation of that theme from her first card. I have nowhere near the coloring skills that Kelly does, so I chose a solid leaf stamp and colored inks to bring in my colors, I stamped a whole panel of maple leaves, masking as I stamped, and then, inspired by her last card above, I die-cut a sentiment from that panel. Your next stop on our Hop is the amazing Linda Trace, but before you go, what's a hop without some fun prizes? If you leave a comment by 11:59 PM, Thursday, October 29, along each stop, you'll be in the running to win a prize from one of our sponsors: TWO prizes (a $25.00 gift certificate and a crafty goodie bag) from a2z Scrapbooking, a gift certificate from Altenew, the Winter 2015 Card Kit from Create a Smile Stamps, a stamp set from Dee's Artsy Impressions, one of Deepti's designs from STAMPlorations, a $25.00 gift certificate from any online store (winner's choice) from djkardkreations, a crafty goodie bag from Hero Arts, a $25.00 gift certificate from The Ink Road, a police woman digi stamp from Lia Stampz, and a $25.00 gift certificate from Simon Says Stamp! Winners will be notified by email after October 29. After I colored and fussy-cut the robin, I cut a stitched tag and then stamped my sentiment. Next I embossed it, then used my glue pen to add glitter to the embossed snowflakes and his hat, and then added everything else. I found a new (to me) challenge and this month they've asked us to use paper-piecing, so I wanted to give it a try. 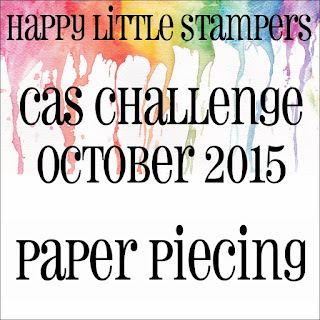 The challenge is from Happy Little Stampers. This was really a fun project, finding papers that mimic the colors of the leaves right now. You can bet that I'll be playing with this set again with pinks when spring gets here! This week our theme is "Wrap it Up!" and the design team are using May Arts products. I wet my watercolor panel, then inked the reverse of my leaf stamp in distress ink, spritzed it liberally with water again and then stamped and let it sit on the paper for awhile to absorb. I wanted just a general leaf shape without any details. I did this 4 times using fossilized amber, spiced marmalade, ripe persimmon, and barn door distress inks. There were puddles of ink on the paper, so I dipped a paint brush into some of them and flicked the color onto the panel before carefully blotting away the excess and heat-drying the panel. Then I added my twine wreath and and bows, and the rest of my elements. I love how this turned out! 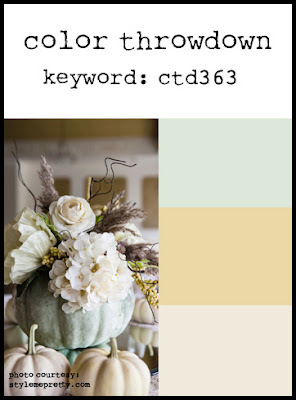 I'm pleased to be a guest today at the Color Throwdown challenge, and here are our colors for this week! I hope you'll play along, too - I can't wait to see what you do with these colors! We had a scramble, our 120th!, yesterday at the Hero Arts Flickr group. Our task was to make a Christmas/Winter card and add some sparkle or shine to it, using at least 1 Hero Arts product. This will also be entered into the current Hero Arts challenge: Holiday Cards. This kit has some really fun die-cuts, a whole pack of them by Pebbles! I started with one of the Simon 120# side-fold cards as my base, then chose one of the large leaf clusters and just added it to one of the design papers, stamped my sentiment from the new clear stamp set, Apple of my Pie, embossed it in gold, and then sprinkled some sequins in coppers and golds. What could be easier? There are also some apple puffy stickers, rub-ons and pretty cardstock colors, too! I know this one will sell out, so don't wait too long, if you're not already a subscriber to these fun kits! Simon's new Winter Release: Create Joy! Another another from the same set, this time a baby bear in his snuggly onesies! Hurry on over to the Simon Says Stamp Superstore to see all the other A-mazing things that are new today! Enjoy! The Design Team are using Stampendous products this week. My first card uses a cling set that was introduced back at CHA January, and it was so popular at the time it took me months to get it. This uses only one of the 3 flower choices in that set, and I really like it done in these fall colors! The owl was stamped and embossed in Liquid Platinum to give him a glow, then colored using the colors that were highlighted in our inspiration. 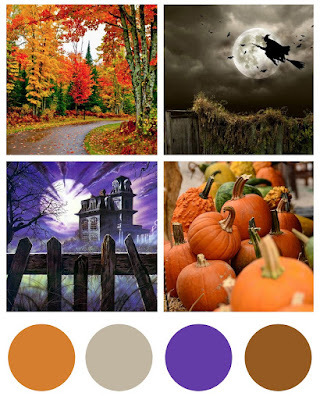 "Autumn Neutrals" is the challenge at The Card Concept this time. Here's my entry, in the Clean & Layered category. I love these subtle colors! It was that bit of plaid blanket in the bottom corner of the photo that got this whole thing rolling! Look, Ma - No Stamping! 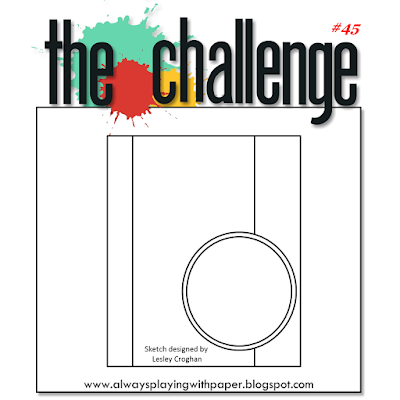 I took a different approach this time to the challenge #45 - I used all design papers from a 6" pad and followed the sketch. I can never resist a good pad of paper, especially when it has an autumn theme and gingham inside, and so this card was born. 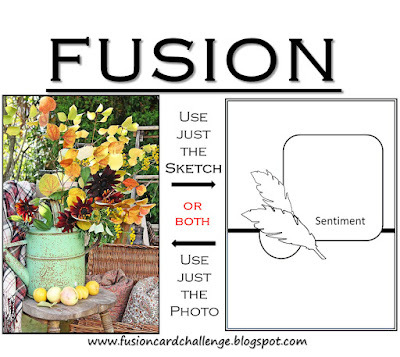 I substitued the rectangular panel, many of which are also inside the pad, for the circle in the sketch, and added some twine to make it look like a hanging picture. I also die-cut an autumn leaf and popped it above the one on the "picture" to give this a little dimension. I also used another favorite of mine, washi tape, to bring in more of the colors, and I added some enamel and wood dots in those colors, too. 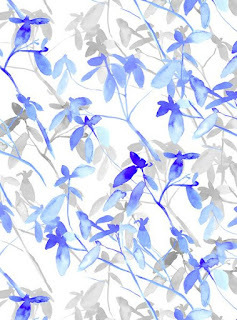 Blue is my favorite color, so I just had to play at the current Pinterest Inspired challenge for this month. This week our theme is CAS Christmas, and the Design Team are using products from Memory Box. They make the most gorgeous detailed dies - I was lucky to snag a pretty wreath die called Catalina Wreath. Here are 2 cards I made using it. This next one is not at all Clean and Simple, but I thought this patterned paper in the background went so nicely with it, I shared it with you anyway. Love the country look of it! I paper-pieced the flowers onto the green wreath, and added little white pearls in their centers to mimic the flowers in the paper, then popped the whole wreath up above the card surface to help it stand out a little more. I paired it with one of my most favorite Christmas sentiment sets from Hero Arts, now sadly discontinued. The dotted letters just seem to go along with the whole style of the card.